It’s Monday! That means that it’s time for another Children’s Style Guide. This week’s we are featuring a look for your daughter that shows off the hot new trend, neon colors. This week’s look was put together by Taylor Joelle Designs‘ owner and designer, Jenny. We know that you will be inspired! Bright neon colors are all the rage right now! 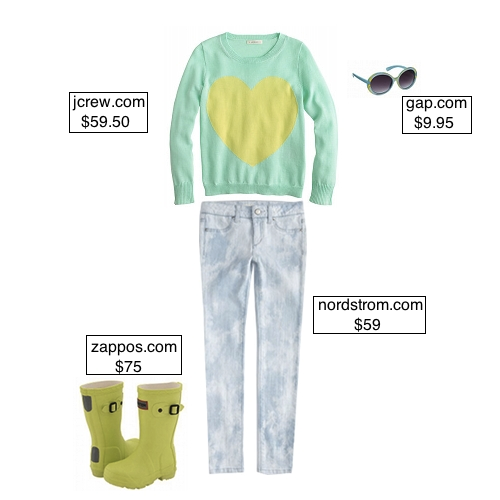 Start the look with this aqua sweater from jcrew.com. Next add denim leggings from nordstrom.com. Accessorize with coordinating sunglasses from gap.com. Finish the look with hunter boots from zappos.com.